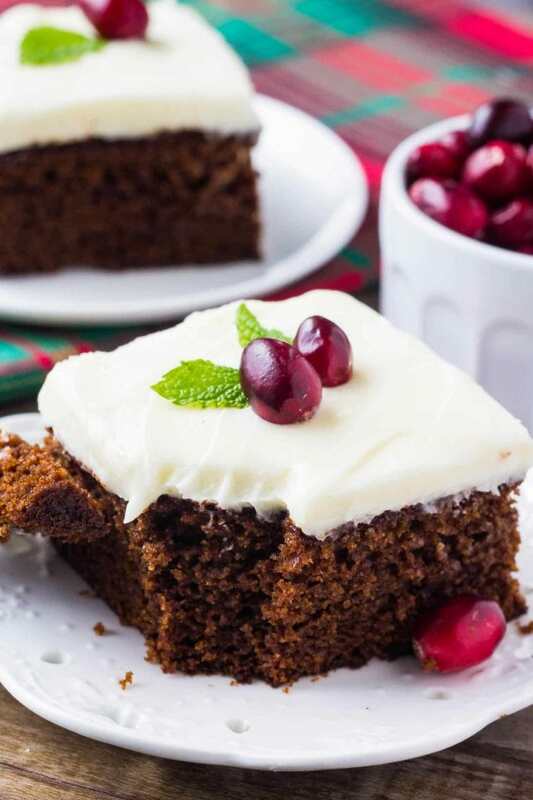 This moist gingerbread cake with cream cheese frosting is perfect for the holidays. Filled with ginger, cinnamon, brown sugar & molasses – it’s packed with warm, cozy flavors. 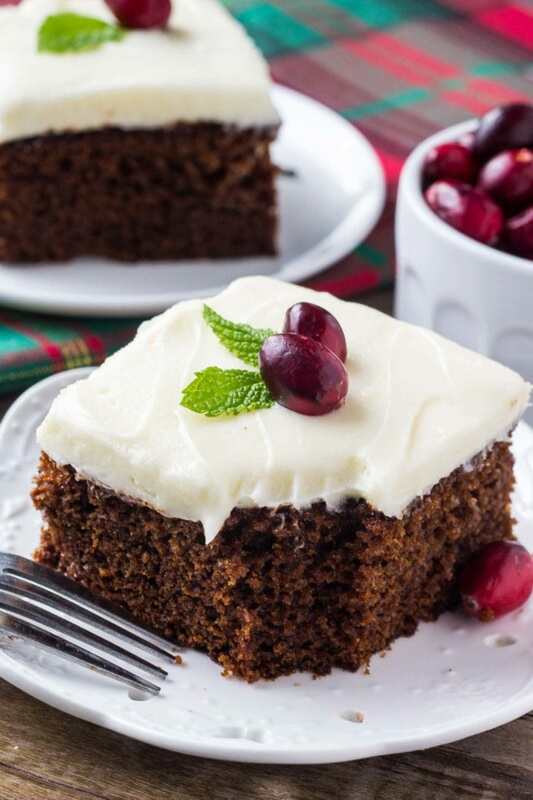 You can help keep freshly baked gingerbread cake fresh a little longer by storing it in the fridge, but it is not recommended because it dries out much faster there. … For a long-term option, you can freeze your gingerbread while preserving its taste and texture if you use an air-tight freezer safe container. Gingerbread is such a classic when it comes to holiday baking. 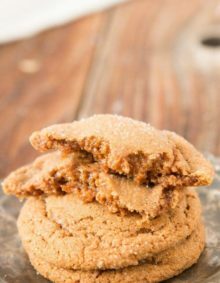 The warm spices, molasses and caramel brown sugar create such a warm, cozy flavor that’s perfect for colder weather. 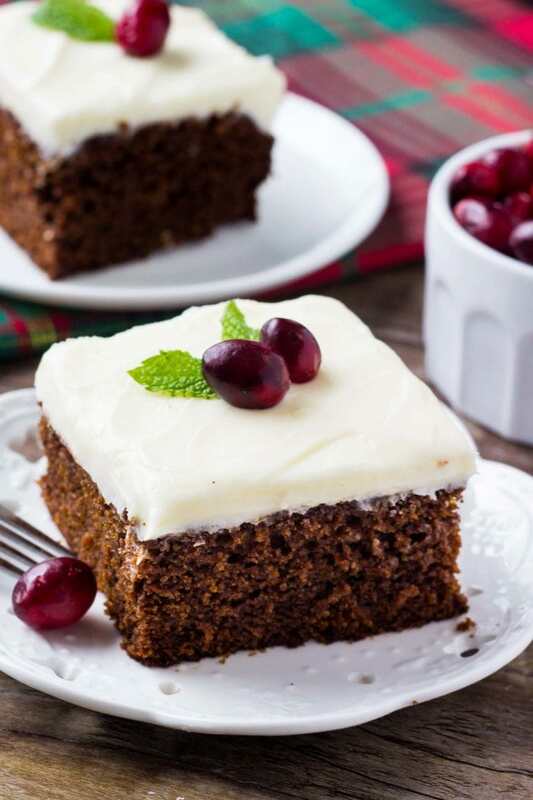 And this moist gingerbread cake with cream cheese frosting is perfect for your holiday get togethers. When it comes to the holidays, Christmas is my absolute favorite time of year. Most years it’s the only time everyone in my family is in the same place. So spending time at my parents’ house means the holidays are filled with love and laughter. Why do We Make Gingerbread Houses at Christmas? The tradition of making decorated gingerbread houses started in Germany in the early 1800s. … German bakers began baking ornamented fairy-tale houses of lebkuchen (gingerbread). These became popular during Christmas, a tradition that came to America with Pennsylvanian German immigrants. Christmas is also my favorite time to bake. Not only are there so many delicious holiday treats, but more importantly – I love spending time in the kitchen with my Mom and sisters. It’s the perfect place to catch up, reminisce, and maybe burn a batch of cookies…. So for today – I’m sharing this gingerbread cake with cream cheese frosting. It’s moist, deliciously dense, and has the most delicious gingerbread flavor. The cream cheese frosting isn’t too sweet. Then I decorated mine with cranberries & mint leaves to make it a little more festive. This recipe is really straight forward to make. First we stir together the molasses with hot water – if you miss this step, the molasses is too thick and won’t mix evenly into the batter. Whisk together the dry ingredients: flour, baking soda, salt, ground ginger, cinnamon & cloves. The warm spices add soooo much flavor. Then beat together the oil, brown sugar, vanilla extract & eggs. Using oil makes the cake extra moist, then the brown sugar gives a delicious caramel flavor. Finally the dry ingredients and molasses are mixed in, and it’s time to bake. The cake will bake for about 35 minutes, but I always start checking just a little early to be sure. How Long Will Gingerbread Cake Keep? The gingerbread cake will keep well in an airtight container for several days, if not longer. In fact a ginger cake is often at its best a few days after baking! 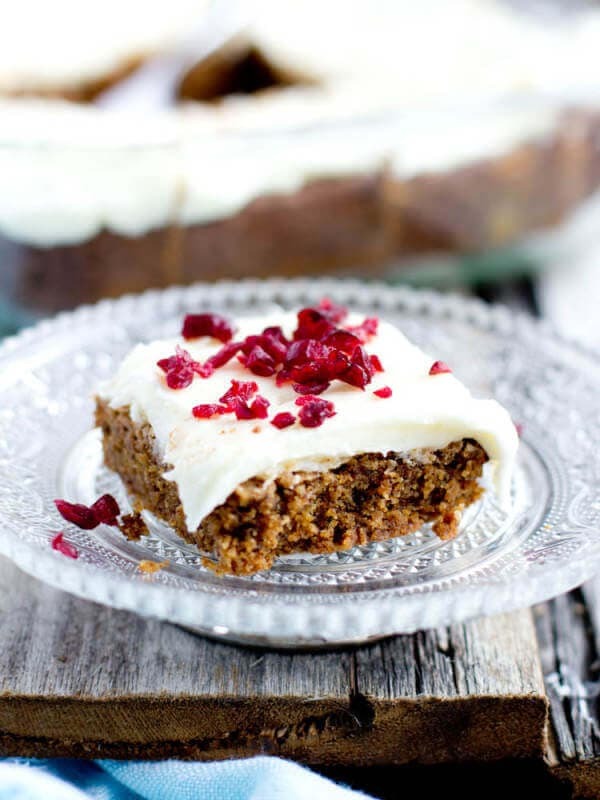 Then to top it all off, the spiced gingerbread cake is slathered with tangy cream cheese frosting. 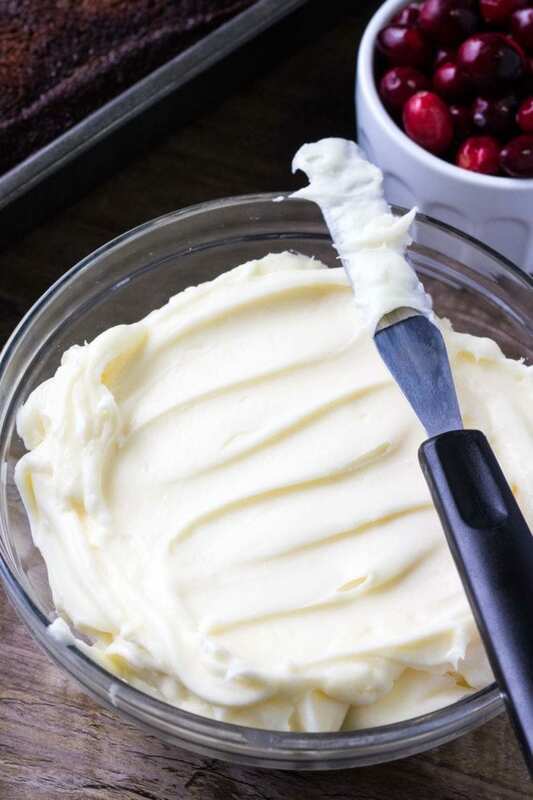 For super smooth cream cheese frosting, make sure the butter and cream cheese are warmed to room temperature first. Then we beat together the butter and cream cheese – and finally the powdered sugar, vanilla extract and salt are mixed in. For a little more holiday cheer, you can decorate with cranberries & mint leaves like I did in the photographs. Or a few festive sprinkles look so pretty too. 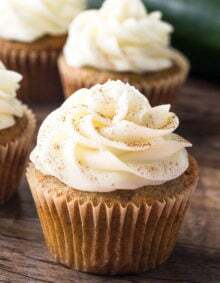 I absolutely love gingerbread – and when it comes to the holidays, this gingerbread cake with cream cheese frosting is the perfect easy recipe! 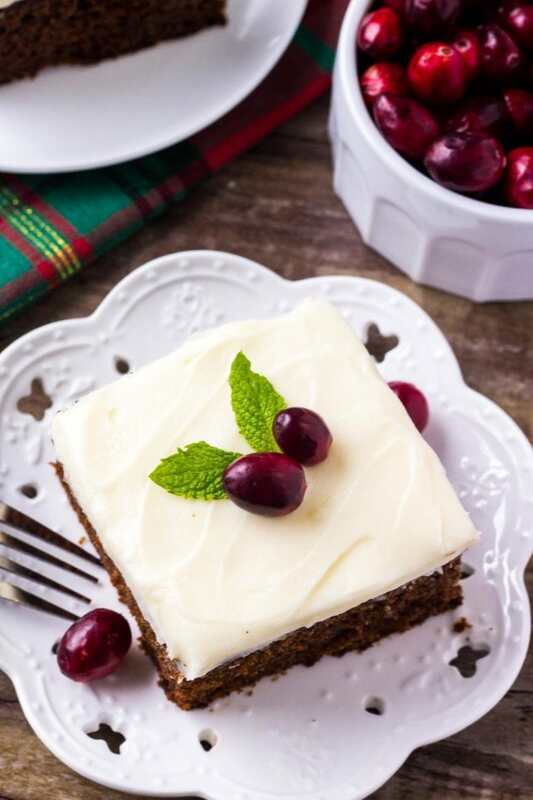 This moist gingerbread cake with cream cheese frosting is perfect for the holidays. 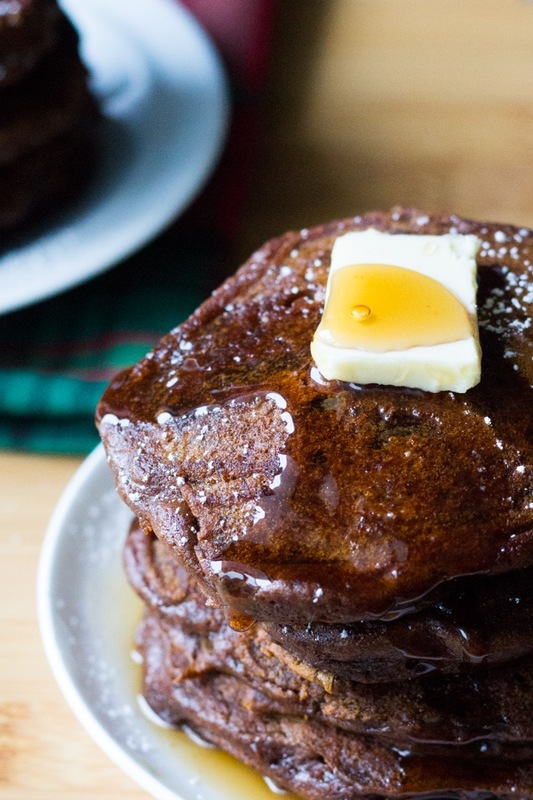 Filled with ginger, cinnamon, brown sugar & molasses - it's packed with warm, cozy flavors. In a large measuring cup, gently stir together the molasses & boiling water. In a medium bowl whisk together the flour, ginger, cinnamon, ground cloves, baking soda and salt. 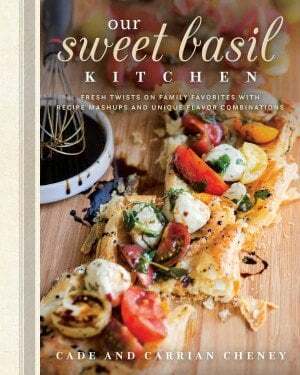 Using an electric mixer beat together the oil, sugar, eggs and vanilla until evenly combined. Then with the mixer on low speed, beat in about 1/3 of the flour mixture followed by about 1/3 of the hot water & molasses. Repeat until all the flour & molasses are mixed in. Turn off the mixer and scrape down the sides of the bowl as necessary. Pour the batter into the prepared pan and bake for 32-37 minutes, or until the top is set and an inserted toothpick comes out clean. In a large bowl beat together the butter and cream cheese until evenly combined. Beat in the powdered sugar about 1 cup at a time until the desired sweetness level is reached. Then beat in 1-2 tablespoons of cream as needed. If the mixture is thin, you may not need to add any cream. Frost the cooled cake. Then optionally decorate with cranberries and mint leaves. This cake is also a great recipe to make ahead. You can bake the cake and let it cool. Then wrap tightly in plastic wrap and freeze. The night before you'd like to serve, thaw the cake in the fridge. Then frost the next day. Fudgy gingerbread brownies topped with white chocolate cream cheese frosting. 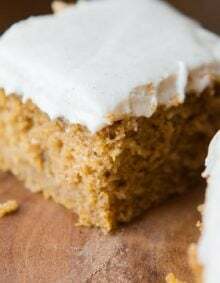 These easy gingerbread bars are perfect for Christmas. This recipe looks wonderful! Do you think it might work for cupcakes too? If so, how long would you suggest baking for regular sized cups? Yes, they will definitely work for cupcakes. 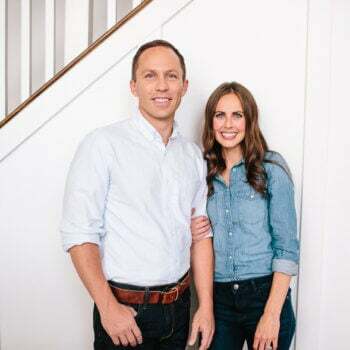 Try 18-20 minutes to start and just keep your eye on them! Enjoy! Do you think this cake would work okay in layers, or is the texture too soft? It looks amazing. Thanks! We’ve never tried it in layers, but if you try it, let us know how it does! It’s a pretty soft cake, but I think it could work! This cake looks insanely delish, especially that cream cheese frosting!